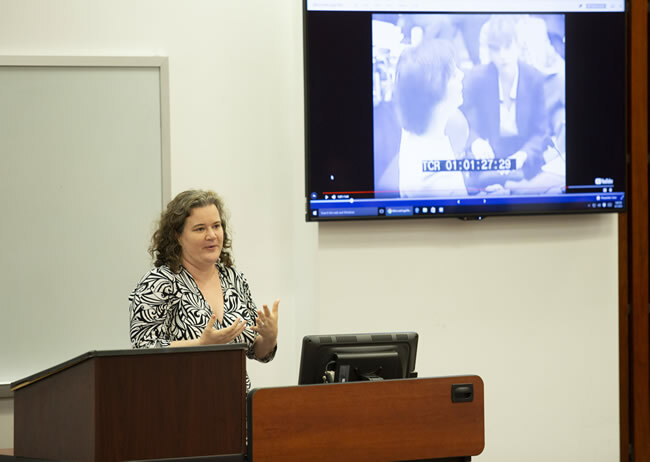 Assistant Professor Amanda Watson, Director of the O'Quinn Law Library, discusses the necessary steps a practitioner should take to stay up to date in their research during a recent continuing legal education session at the University of Houston Law Center. June 14, 2018 — O'Quinn Law Library experts in specialized legal research recently shared techniques at the "2018 Legal Research for Texas Lawyers" workshop at the University of Houston Law Center. Topics included tips on how to do legal research on health law, immigration law, and tax law, and using legal research to fulfill ethical obligations. Assistant Professor Amanda Watson, Director of the O'Quinn Law Library, stressed the importance of updating, versioning and staying current in the law when conducting legal research to fulfill ethical obligations. "Making sure that you present accurate information is one of our main obligations both to our clients and the court," Watson said. "If you don't validate your research, then you may not be giving the correct information to your client and the court." Watson encouraged attendees to avoid low-cost alternatives to citation websites like Westlaw's KeyCite and LexisNexis' Shepard's Citation Service. "Most of the low-cost alternatives to Shepard's or Keycite are algorithms only," Watson said. "They're not hand-edited. Both Lexis and Westlaw literally have football fields of cubicles of lawyers who are hand editing their KeyCite and Shepard's services. That hand editing makes a big difference in the results you get. "When we talk about citation services like KeyCite and Shepard's, they're usually used for two reasons. You can either use them to do research to find cases like your case, or you can use them for validating. Those other low-cost alternatives are great for just doing more research, but not great for when you want to validate your research." Chris Dykes, Head of Public Services, discussed researching the primary sources of tax law. He provided resources to help locate relevant statutes, regulations, case law and administrative materials. Dan Donahue, the library's Foreign and International Law Librarian, lectured on the principles of researching immigration law. He examined areas of primary law, federal agency resources, secondary resources, and related legal subjects. Robert Clark, a Law Reference/Research Librarian, and Emily Lawson, Associate Director of the O'Quinn Law Library, concluded the event with a session on health law research that centered on primary legal materials related to the field. Clark began with a quick introduction to health law, discussed basic sources for health law research, and pointed out where to find statutes online. He also went over a number of free resources the library makes available to attorneys. Lawson's presentation was focused on administrative law, which included regulations, agency decisions and agency guidance related to health law. Attendees received 3.5 hours of Texas Continuing Legal Education credit, including one hour of ethics.